First lets assemble the cast of characters! Wax paper to lay your fabric down on. First you want to brush the Fabric Stiffener & Draping Liquid on each of your pieces of fabric. It coats on white but dries clear so you can see where you have applied the adhesive to. Apply liberally all over your fabric and allow to dry. It takes about 30 minutes or less to dry but I left mine to dry overnight because I had other things I needed to get to - like laundry and grocery shopping and sleeping - you know every day things. Using your die or punch or scissors punch or cut out the shape you want to do. You'll notice that the fabric has sort of a sheen to it now. In case you didn't know Fabric Stiffener & Draping Liquid by Helmar is Non Toxic and Acid Free! I layered all 3 different fabrics to make layered flowers using 450 Quick Dry Adhesive and sort of scrunched them. The Fabric Stiffener allows you to scrunch or manipulate your fabric embellishments at whim and they'll hold their shape! This is the final project I made and I love that I have some homemade one of a kind accents to complete my project. All papers and buttons to crate this layout were provided by our awesome sponsor Nikki Sivils Scrapbooker. And the burlap string was provided by Creative Impressions. Thanks for stopping by. Now get scrapping! This day and age we all love to save a few $$ when we can. Today I have a quick and easy way to make your own flourishes, or crystal designs using Helmar Gemstone Glue and The Robin's Nest Dew Drops. My fellow DT member Aymee has always raved about these Dew Drops and she is right, they are fun to play with! This is the end result, on white paper. Of course you can use any paper you want. I love placing these flourishes on the edge of my photos for layouts. Also on the front of cards. Here is a quick video tutorial on how to make your own! Thanks for checking out the Helmar blog today! I hope you make your own bling and share with us. We love seeing what you can do with Helmar! Announcing the 2010 Helmar USA, Design Team!!! 4/27/10 CORRECTION AND APOLOGY: My agpology for omitting one Guest Designer, Sarah Mullanix. Sarah, I apologize for this oversight and you are indeed our October 2010 Guest Designer. Thank you everyone who applied for the Helmar USA Design Team. We were amazed at the talent and the selection process was a tough one! Helmar USA, Inc. welcomes and congratulates our designers and guest designers! We are excited to share their creations in 2010! Time to grab those summery fun scrap supplies and make a whimsical hanger. My local scrapbook store asked me to come up with a fun class project so I broke out the acrylic sheets from Clearscraps and had some fun. I have found nothing better then Helmar 450 Quick Dry and Helmar Zapdots, to use on an acrylic project. Not only does the 450 dry completely clear (with no bubbles) but it is also very strong, which is perfect for home decor. I don't have to worry about anything falling off or sagging, and I never have to worry about my paper buckling or wrinkling. You can see the ZapDots add dimension, I used them on the flower and the flourishes. On come of them I used the white foam Zapdots, because they sit a little bit higher, and on the other flourishes I used the clear Zapdots because they are slightly lower, it gave this sign a really 3-D look. Quick,easy and durable is what this chick is all about! I'd love to see some of your summer projects! All of us at Helmar love to see what you make. Happy weekend & HAPPY SUMMER too! That's why we craft isn't it? For the fun of it? To me, there's nothing more enjoyable then pulling out the paper, scissors and glue and just letting loose. I never thought I'd ever refer to glue as a "fun" product, but I really enjoy using my Helmar Adhesives. I always get such a kick of seeing what new things I can do with them, and that always opens up my mind to be a little more adventerous. Another product that does that for me is Urban Lilly papers. A friend once said to me "if you really want to make the most out of them, you can't be afraid to cut them". Great advice indeed. When I started working with the "Mooch" collection from Urban Swank I did just that. The result is this wacky layout that is just plain fun! When I was done, it didn't look quite finished. It needed that extra "pop". I reprinted my photo, cut out just the face and attached it to my layout using Helmar Liquid Scrapdots. That was just what it needed to really take it over the top. And of course, what little girls sunglasses would be complete without a little bit of bling? Thank you to Helmar Preferred Partners Urban Swank, Core'dinations Cardstock, Crafters Workshop and Creative Impressions for the supplies for this project! Prima "Say it with Crystals"
We are now 950+ Helmar Facebook Fans STRONG and well on our way to 1000! When we reach 1000 Fans we want to make all our Helmar Fans feel welcome with a chance to win this Prize Pack with some of our most popular adhesives. Random draw when we reach 1000 Helmar Fans so please keep referring fellow crafters, friends and artists! Don't you all just love Spring?!?!? In Colorado we definitely have 4 seasons and every Spring I always await in anticipation of the flowers blooming and the trees beginning to bud. New season....new life! It always re-energizes me! I've been loving all the newly released Spring products that have hit the market lately and flowers has always been an all time favorite of mine! Whether it's paper, chipboard, felt, ribbon, canvas you name it I love flowers! Which is why it was so easy for me to want to create fabric flowers using some fabric I had on hand and Premium Craft Glue by Helmar. I took a few pictures to show you as a tutorial to create these simple fabric flowers. Seriously they were so easy and Premium Craft Glue dries so quickly you can move on to finishing your project super fast! First you want to start with Helmar Premium Craft Glue, a cardstock circle about 2-3 inches in diameter, and a strip of fabric about an inch or so in width. Really you can make your fabric larger and even use ribbon if you want. Take a dab of Premium Craft Glue and place it in the center of your circle. Fold your fabric in half and attach to the craft glue and allow to dry for a bit. Which is really all the amount of time you need.... a bit! Start twisting the fabric and coiling it around the circle adhering dabs of Helmar Premium Craft Glue as needed. Continue twisting an coiling until you cover the entire circle. If you end up having a bit of cardstock showing around the edges just trim it. Allow your fabric flower to dry and attach either a brad, buttons, bling or whatever your heart desires to the middle of the flower and then finalize and create your project. Thanks for stopping by! Now get those fingers sticky with Helmar Adhesives! You can make them what you want, I can see these being done so many ways. Perfect for cards, layouts, even a wreath would look adorable with these book print bows. They reminded me of years gone by with the old print on the papers. So I went with a retro-old school feel layout. Here is a video to give you a step by step on how to make these yourself using and old book, scissors, and your handy dandy Helmar 450 Quick Dry. On this layout I used the ever amazing Melody Ross GCD Studios paper, wow it was so fun to work with, all the glitter on the butterflies made me happy. This layout only took 15 minutes, and that is perfect for my schedule. Elegant and fun at the same time. I hope you try making these Book Print Bows, I love them so much! If you do make them PLEASE come and tell us about it. Nothing makes a designer happier then knowing they inspired someone else to get crafty. As much as I clean and purge out my scrap supplies, donating my excess to the neighborhood girls (much to their delight!) there are still so many “scraps” and “bits” of paper and embellishments that are so beautiful, I cannot bear to throw them out or give them away – no matter how small! I have just created the perfect way to use your very small scraps that will elicit “oohs” and “aaahs” of admiration and appreciation! Magnetic bookmarks for the readers in your life! Clip one of these homemade bookmarks onto a book and you have the perfect gift. · Lots of magnets are available at your local craft store. I find the self-sticking magnet rolls work best as they are very thin and you can cut the amount you need right off the roll. But THEY ARE NOT REALLY SELF-STICKING! Once you peel the backing from your magnet piece, apply Helmar 450 Quick Dry before adhering to your bookmark. If you rely on the factory applied stickiness, your magnets will fall off of your bookmark after a few uses! 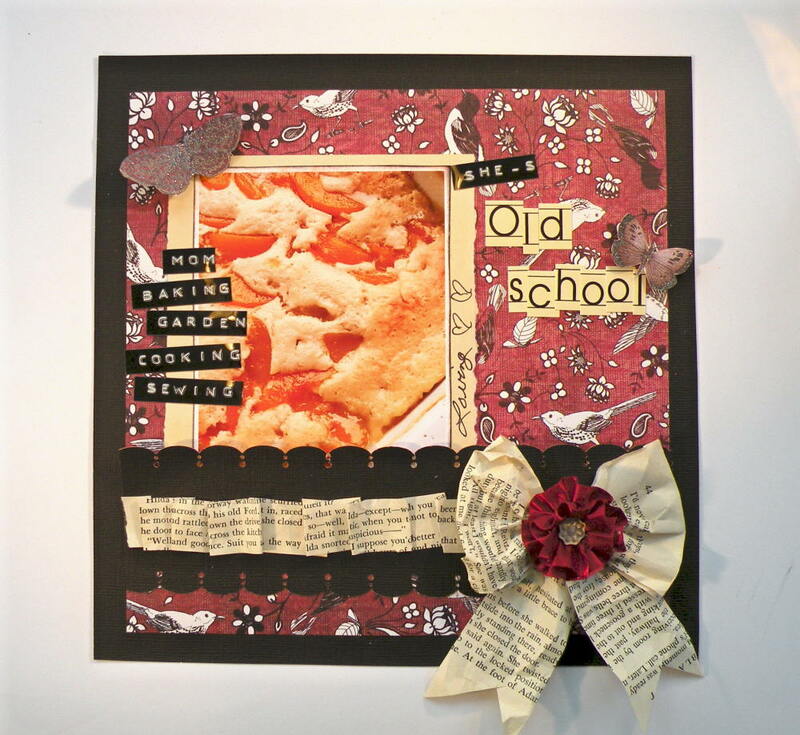 In this first example I am using a yummy Urban Lilly Polka Dot Photo Card that I cut down to size. I applied a monogram using My Stamp Box “Color Me” Alphabet Set and Clearsnap Ink. I also used Clearsnap around my edges. The flourish is Prima “Say it in Crystals”. I added machine stitching to the edges of both bookmarks to give them a “finished look”. Thanks for stopping by! If you create any bookmarks, hit us up on Facebook - would love to see your take on this idea! We would like to thank everyone who has fanned Helmar on Facebook! The turnout was amazing and we are happy to award our winner for referring the most Friends to Fan Helmar..............Tracey Taylor. Congratulations! You have won this cool Helmar Facebook Prize Pack! Tracey please EMAIL info@helmarusa.com with your address and we will get your prize out to you!